Online ordering menu for ANTHONY'S NEW YORK STYLE PIZZA. 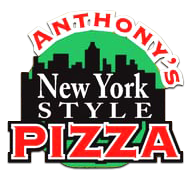 Come to Anthony's New York Style Pizza where we offer delicious pizza, calzones, subs, We also serve sandwiches, gyros, and wings! We are located at the corner of Gunn Hwy and Anderson Road. We're near Westgate Plaza and Logan Gate Dog Park. Order online for carryout or delivery!